I'm a little late with my posts this week so you will see them all over the weekend as I play catch up! 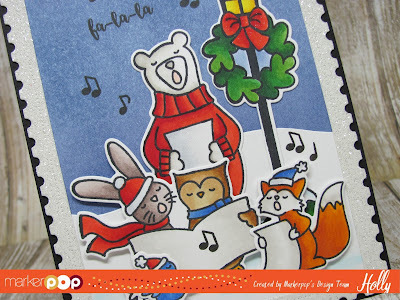 Thursday I was up on the Markerpop blog using the Avery Elle Caroling Critters set and the STAX Postage Stamp Die set. I started out with a piece of Tim Holtz watercolor paper and I added some Distress inks in Faded Jeans and Chipped Sapphire. 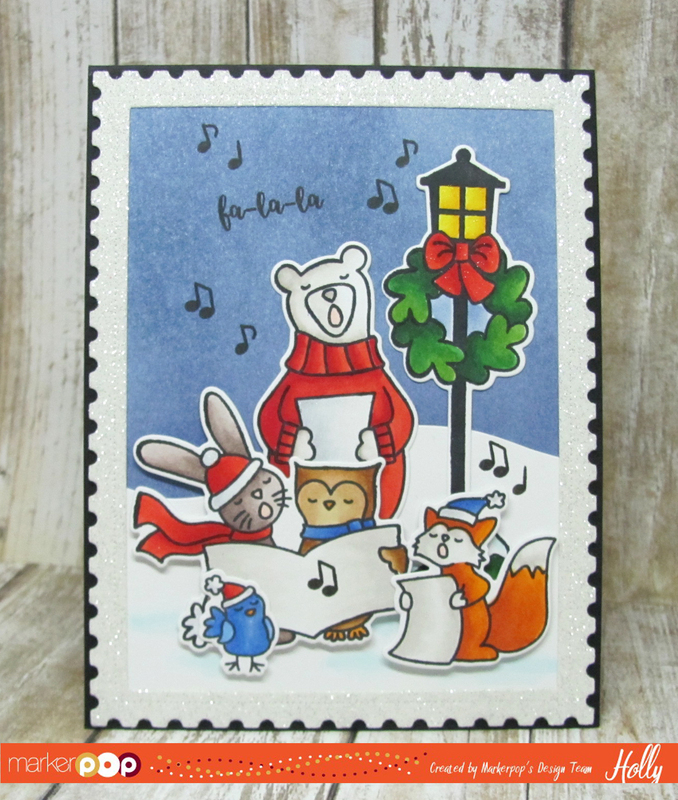 Then I die cut the Largest of the Postage Stamp dies from a piece of White Glitter card stock I found in my stash. I trimmed the watercolor panel to fit inside the Die cut area. 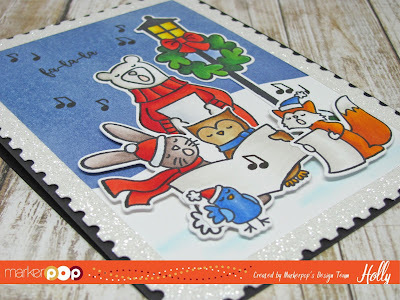 I die cut a piece of Neenah Solar White card stock with the MFT Scenic Safari Die to create a snowy hillside. 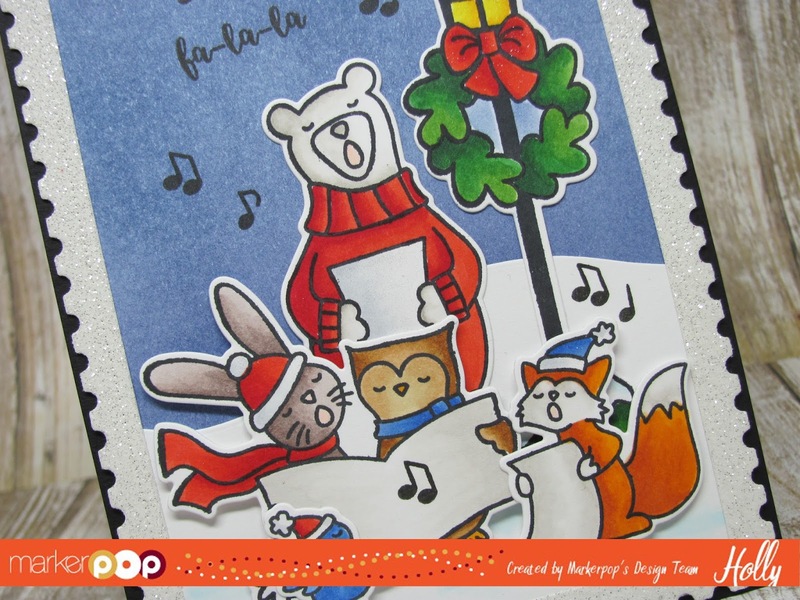 I adhered the hillside and then added the glitter frame over the background panel. 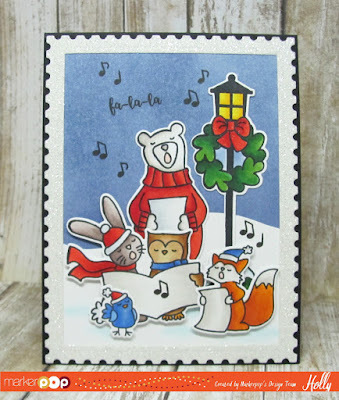 I stamped all the images from the Caroling Critters set from Avery Elle with some Memento Tuxedo Black ink onto some Neenah Solar White card stock and colored them in with Copic Markers. I die cut the images using the coordinating dies and adhered them to the background panel using some foam tape. I adhered the image panel to a top folding Back card base with my Advanced Tape Glider and then I stamped the musical notes and the sentiment form the Caroling Critters set with some VersaFine Black ink. For an added touch of Shimmer I added some Clear, Red, Yellow & Green Wink of Stella to certain parts of the image but it's a little hard to see in the photo though.